Yesterday March 13, Roger Webb and I went up to the Minus Face to take advantage of the unusually good ice conditions at mid-height on the Ben. Unfortunately the thaw had set in which spoiled our chances of climbing Minus Two Buttress. We reverted to Plan B, and climbed a good icy mixed route up the rib between Wagroochimsla and Platforms Rib. Differentiation (VI,6) provided three sustained pitches with an unlikely finish through the roof guarding the raised crest at the top of the face. It was a murky and windy day, but the ice stayed good in the Minus gullies, which all saw ascents. 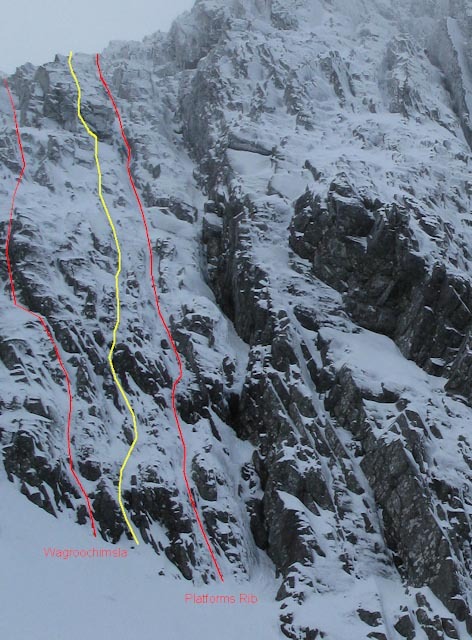 This entry was posted in New Routes, Topos and tagged Ben Nevis, Minus Face, Roger Webb, Simon Richardson. Bookmark the permalink.